How do we practice it in our day to day? Dictionary.com says that “lo” is actually an interjection frequently used in Biblical expressions and it means: “look! see!" More and more I am being encouraged to welcome God’s presence into every moment of my life. I’ll be honest with you – it’s not easy. Often, I get caught up with my schedule and before I know it, a whole day has gone by, and I’ve forgotten to pray, give thanks or simply “be” with God. Do you struggle with the same thing? What if we instead, practiced God’s presence all day, everyday? What if we let him in on the little things that bug us and those special moments that bring us joy? I’ve found that God doesn’t barge in our day to day, but instead waits to be invited. And this has to be a conscious effort on our part. How much peace do we miss out on because we don’t do this? It does take effort, but I know that it’s a habit worth forming. Brother Lawrence held a lowly position working in a French monastery kitchen in the 1600s. And yet, people were drawn to him for his character and close intimacy with God. And the book has gone on to bless Christians for centuries. I remember reading portions of the book long ago and being struck by Brother Lawrence’s ability to transform even the lowliest of tasks, like mopping the monastery floor, into special moments with his Father God. In other words, it takes some work to begin with, but after experiencing its benefits, we can practice God’s presence with ease. When I was a new Christian, I faithfully read the Daily Guideposts devotionals, and they always gave me a nugget of truth that I could take into each day. After Lo became a Christian, he was overjoyed to find a scripture that he felt was written just for him. 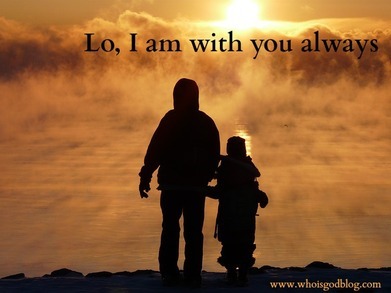 “Lo, I am with you always”! And even if your name’s not “Lo,” the scripture is for you, too. 12 You have preserved me because I was honest; you have admitted me forever to your presence.